On Saturday November 8th and Sunday November 9th Richard Pedranti Architect, participated in our first International Passive House Days event showcasing our first Passive House project, the Scranton Passive House. International Passive House Days is a global event organized by the International Passive House Association (IPA) and locally by the New York Passive House Association (NYPH). The event provides an opportunity for owners and architects to share their experiences and show first-hand what Passive House is all about. Visit the listing for the Scranton Passive House on the International Passive House database. As the architects of the first Passive House in Northeastern Pennsylvania, RPA worked to educate the local residents of Scranton and Wilkes Barre, Pennsylvania. On Friday November 7th, my office provided a private tour to Clay Lepard of WNEP TV; Brendan Gibbons, Environment and Natural Resources writer for The Times Tribune; and Michael J. Mullen, staff photographer for The Times Tribune, the area’s daily newspaper. Clay reported our project on the 5PM evening news as part of his Power to Save series and you can view the broadcast now. Brendan wrote a fantastic piece for The Times Tribune that made the cover of Saturday’s newspaper. You can read his story now. We had a remarkable turnout for our Saturday and Sunday tours with many visitors saying they learned about our project from the news coverage. My associate, Michelle Sangster, and I estimate we spoke with over 250 people who toured the Scranton Passive House throughout the weekend. Both Saturday and Sunday were cool fall days with partly cloudy skies and temperatures in the 50’s. The main living space in the Scranton Passive House was a wonderful venue for hosting the event with its open space and large south facing windows. The visitors could feel the passive power of the sun as it shone through the large windows and warmed the interior to a comfortable temperature. The windows, manufactured by Intus Windows, were interesting to the visitors because of their triple pane glass, tilt / turn operation, and multipoint locks that seal airtight when they are closed. Our office organized the tour based on RPA’s 5 principles of Passive House with each of the 5 principles clearly labeled within the house. Visitors could follow the RPA diagram around the project to learn the basics of the Passive House approach. Our wall mock up displayed how the exterior walls are assembled, providing a clear understanding of how the insulation cavity is created to allow for 12” of dense pack cellulose resulting in insulation levels 3 times higher than a US code built home. RPA also set up our Retrotec blower door in on the exterior door opening to demonstrate how we depressurize the interior air volume to test for air leaks in the exterior shell in order to meet the very demanding air tightness required in Passive House certification of 0.6ACH@50Pa. Robert Campbell, of Millbrook Cabinetry, the window distributor of the Intus Windows, was on hand to provide information about window performance. 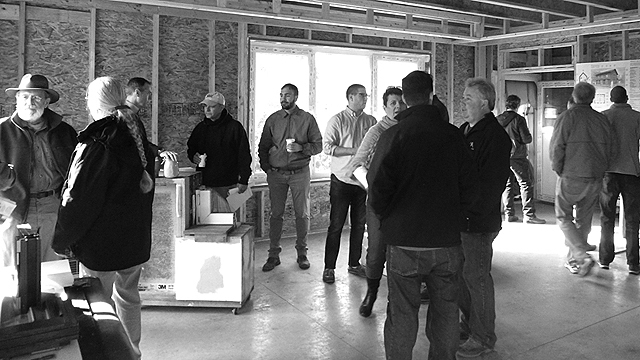 Rob Ciervo, general contractor, shared his experiences with visitors on building NEPA’s first Passive House. While Michelle and I enjoyed educating as many visitors as we could. It never ceases to amaze me how after you describe what a Passive House is and how it works people say, “Why aren’t we doing more of this?” Based on the interest from the open house last weekend, RPA expects to be building many more Passive House projects in the near future. The Scranton Passive House began construction in May of 2014. Work on the project currently includes plumbing, electrical, and mechanical installation with insulation just a few weeks away. Completion is scheduled for January 2015. We are on target to achieve Passive House certification from the Passive House Institute US (PHIUS). Thank you to those who helped with this event especially Robert Kries, Associate Account Executive at Broadpath Communications and Scranton Passive House owners Christie and Declan for sharing their pioneering project with the public.